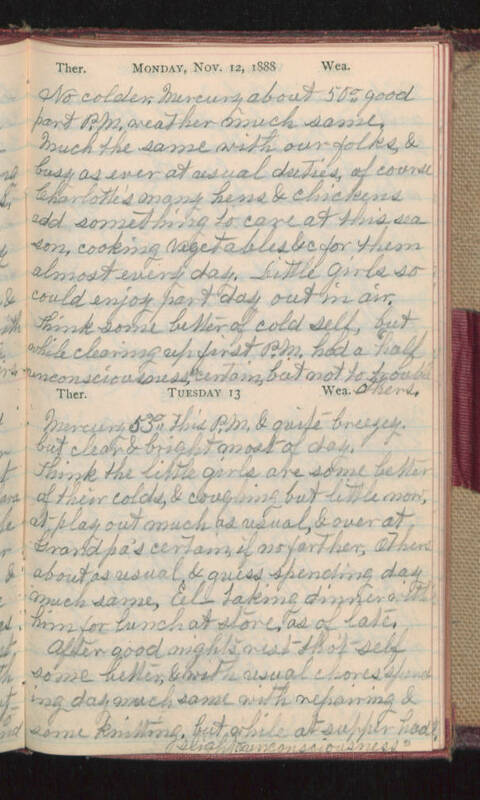 Monday, Nov 12, 1888 No colder, Mercury about 50° good part P.M. weather much same. Much the same with our folks, & busy as ever at usual duties, of course Charlotte's many hens & chickens add something to care at this season, cooking vegetables &c for them almost every day. Little girls so could enjoy part day out in air. Think some better of cold self, but while clearing up first P.M. had a "half unconsciousness" certain, but not to trouble others. Tuesday 13 Mercury 55° this P.M. & quite breezey but clear & bright most of day. Think the little girls are some better of their colds, & coughing but little now, at play out much as usual, & over at Grandpa's certain, if no farther. Others about as usual & guess spending day much same, El- taking dinner with him for lunch at store, as of late. After good nights rest tho't self some better & with usual chores spending day much same with repairing & some knitting, but while at supper had "slight unconsciousness"